This is the third and last CD in a real gem of a series from Hyperion. Volumes 1 and 2 are on Hyperion CDA67949 and CDA67998… the latter was reviewed very favorably here on Classical Net in early 2014. Although not with complete certainty, it's thought that the conductus (plural also conductus) originated in the 12th Century in southern France for the moment in the liturgy when the lectionary was conducted from where it was kept to where it was to be read from. Assuming that this is correct, then the 80% of all the extant examples (over 800) of conductus poetry which have musical settings are to be considered as sacred – but non-liturgical – vocal forms of the ars antiqua period. Of these, more than 50% are monophonic, under 30% are in two parts and the vast majority of the rest are for three and four voices (111 and 3 works respectively). Although implicitly tainted with a somewhat lowly reputation, there is actually a great deal of variety and depth in the poetry, music and art of settings, which tenors John Potter, Christopher O'Gorman and Rogers Covey-Crump are at pains to convey from first note to last. This is not to imply that the studied, focused intensity of their singing is in any way forced. Rather, that they have absorbed the idiom well and want to offer the eleven works ranging in length from two and a quarter to nine minutes on this CD as something different, for sure. And also which – if you listen without expecting them to be anything (splendid polyphony, simple plainchant, saucy song or lengthy expositions on courtly love, for instance) which they're not – they are intriguing, beautiful and very evocative of a world in which word and melody (there is indeed little exploration of advanced harmony) were united to strengthen and express faith. On the other hand, there is immense rhythmic complexity in these works. That is alluded to and explained by Mark Everist in his liner notes. This has to be set alongside the confidence of these three singers. They're hardly "exploring" the genre. They've made it their own. Perhaps this is in part because they are aware of the extent to which the conductus spread by the end of the thirteenth century… into southern Germany and Spain, and as far afield as Scotland and Poland. As you get used to the dry, exposed and apparently simple projection of clearly-understood emotions and themes, the directness of the performers' delivery will appeal because it gently fills your aural horizon and focus, somewhat in the way that a really compelling story-teller commands your full attention. The closing passages of the "Olim Sudor" [tr.9] are a good example of this as the pace is picked up to imply certainty. The tropes are not simple, though. Just unadulterated. This requires complete commitment on the part of the singers. And confidence without over-reaching. These qualities are exactly those possessed by Potter, O'Gorman and Covey-Crump. At the same time, each tenor has his own personality, vocal flavor and tone. Further, these three sound very well together – surely in ways in which presumably singers eight hundred years ago would have done when not specially selected. The result (listen to the texture of the Transgressus [tr.7], for a truly colored set of pure sounds, for instance) is that we quickly gain familiarity with the verses. Quant iou en oi mes aveaus tant com moi vaut plaire, se retorne ses cabreaus, riant s'en repaire. After satisfying my lust - she wanting to please - back to her goats she must, laughing as she flees. The first two CDs examined Marian eulogy in particular. This one, although it refers to the church and its seasons, is more concerned with earthly matters… the juxtaposition of body and soul; the effort of hard work; and the attraction between the sexes. But not in a bawdy way, rather as a celebration of what is referred to in A globo veteri as prudent nature, the way of the world. Directness notwithstanding, there is as much delicacy and tenderness as there is certainty and heavily-muted exhortation in these three singers' approaches. Indeed, their differences of vocal timbre are additive, rather than contrasting. There is no room for error or to equivocate in closely-miked unaccompanied vocal music like this. The acoustic (St. Margaret's Church, York) is very suitable for the intense music presented here. It's close yet not closed. The booklet that comes with this CD has a useful introductory essay, as said, and all the texts in Latin/French and English. If you have the other two CDs in the series, you'll not want to miss this one. 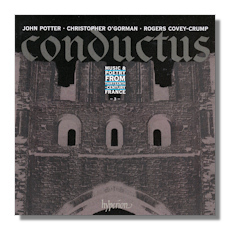 If conductus and/or small scale but wide-ranging vocal music of the period is of interest, you can buy with confidence. Recommended.